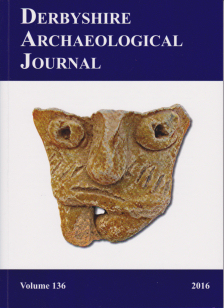 All volumes of our journal (1879 - 2012) bar the last 5 years have been digitised and are available for free at The Archaeological Data Services. http://archaeologydataservice.ac.uk/ and click on Archives and search by putting Derbyshire Archaeological Society in the keyword/search box and publications using these words in the titles will be listed. You can go directly to it by clicking here. The full content list of all published journals (as an Adobe pdf file) is separately available by clicking Journal Contents to right. You can search for words in this file when downloaded (may take a few seconds) by using either Edit/find, Ctrl Shift F (or Ctrl F - one at a time). Return to this page by closing the pdf window. A limited number of hard copy of back issues will continue to be available for a period but the precise issues available at any given time may vary. Enquire for availability of volumes before 1970. After 1970, most volumes are available. 1999-2006 £15 (plus £2 p&p) each. Back issues of the Journal can be purchased from the Secretary (see contact us).